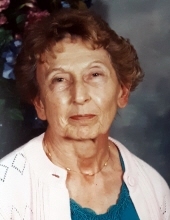 Nancy Fay Bernhardt, 87, of Rochester, formerly of Darien Center, passed from this life with all its troubles on to her eternal reward in Heaven, free from all pain and sorrow on January 29, 2019. She was born to the late Edward and Ada Dorfer on April 16, 1931 and grew in Kenmore, NY. In addition to her parents, Nancy is predeceased by her husband; Donald Bernhardt; and her sister Una. Nancy married Donald Bernhardt on November 21, 1951. After Don completed his service with the Air Force, they settled down on a 170 acre property in Darien Center, where countless fond memories were made there by their children and grandchildren, as well as extended family members attending reunions, and neighborhood children enjoying swimming and ice skating parties. Nancy, Don, and their children were former members of Attica First Baptist Church, where Nancy was actively involved in the AWANA program for children, and also in the choir. She truly was a Godly woman who loved the Lord and always had a desire to lead children to Him. Survivors include her children; Karen (Roger) Kuntz, Mark (Christine Smith) Bernhardt, Rebecca (Edward) Mills, Paul (Ellen Goodridge) Bernhardt and Laurie (Hermann) Weber. She is also survived by 10 grandchildren and 3 great-grandchildren. Family and friends are invited to call from 4:00-7:00PM on Tuesday February 5, 2019 at Marley Funeral Home, LLC. 135 Main Street Attica, New York 14011. A 10:00AM Funeral Service will be held on Wednesday February 6th at the First Baptist Church 3 Prospect Ave. in Attica. Nancy will be laid to rest in Forest Hill Cemetery. In lieu of flowers, donations can be made to the Alzheimer's Association www.alz.org. For more information please call (585) 591-1212 or to leave a message of condolence visit www.marleyfuneralhome.com. Arrangements completed by Marley Funeral Home, LLC. 135 Main Street, Attica, New York 14011. To send flowers or a remembrance gift to the family of Nancy Fay Bernhardt, please visit our Tribute Store. "Email Address" would like to share the life celebration of Nancy Fay Bernhardt. Click on the "link" to go to share a favorite memory or leave a condolence message for the family.